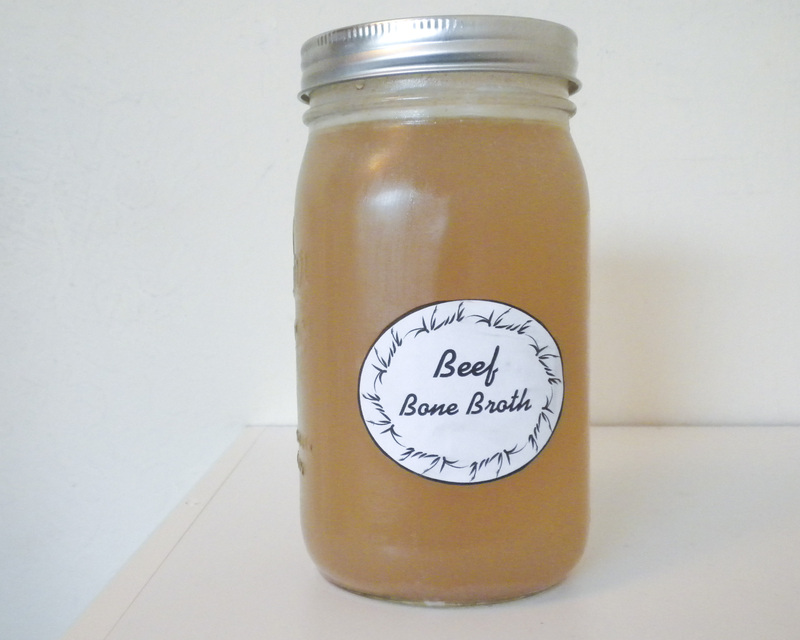 Beef bone broth made from nutrient-rich grass fed beef. Once a week, I awake early in the morning. I will need the extra time. I am going to perform a task that will nourish my body with an almost magical concoction full of natural minerals, gelatin, marrow, and other nutrients, using what may be one of the oldest cooking methods. I have been doing this for over ten years, and my technique has evolved over time, becoming simpler and easier. Today I make bone broth. Bone broth is one of the oldest human foods, and one of the simplest. Basically, bones and meat scraps are placed in a large pot with plenty of water, and simmered slowly until the bones and meat have released their priceless nutrients into the broth. Vegetables are usually added, as is salt. As the water comes to a boil, the scum that rises to the top is skimmed off and discarded. The broth is served hot, and slowly sipped, or used as the base for all kinds of traditional soups. Traditional bone broth, simmered slowly for at least twelve hours, is much richer in minerals, gelatin, and other nutrients than any broth you can buy at a market. It is now possible to purchase traditionally made broth, usually by Internet order, but this broth is so expensive that it makes much more sense to make my own. I have found that all kinds of meat, poultry, and bones will make great broth. At this point, I usually use leftovers, often with some raw scraps and bones left over from trimming various cuts of meat, and find that the broth is every bit as good as when I used only fresh ingredients. 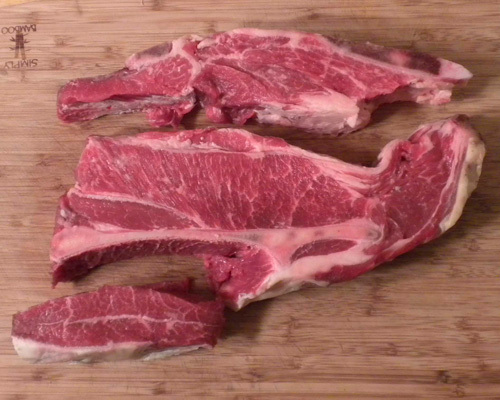 I use only the bones and meat of grassfed/pastured animals or poultry. Our ancestors did not use feedlot animals, or meat containing artificial growth hormones, antibiotics, steroids, and other chemicals, and neither do I.
I use only organic or the equivalent vegetables. I do not want pesticide residue to be released into my broth. I use only filtered water. My filter uses the reverse osmosis process, which is the only way I know to get rid of the fluoride. Fluoride, chlorine, and aluminum are usually added to tap water, along with other chemicals. I do not want them in my broth. Our ancestors did not have these chemicals in their broth. Using reverse osmosis water is controversial, because the conventional belief is that you could suffer a mineral deficiency, because minerals are also removed by the filtering process. Since the mineral content of water differs greatly from location to location, I do not find this to be a good enough reason to have human-made chemicals in my broth. What I do know is that a great deal of minerals are released into the broth during the long simmering process, far more than any tap water would contain. I also add a fair amount of unrefined sea salt. This salt comes with all the natural minerals that are stripped out of factory salt, and these minerals also become part of the broth. My bones and teeth are very strong, dense, and hard, so I know I have no mineral deficiency. On the contrary, I credit my daily mug of broth with helping to maintain my strong bones and teeth. Many people add vinegar to bone broth, the idea being that the acid will cause more of the minerals to dissolve. I used to use vinegar for this purpose, but I have not used it for years. I like the taste much better without the vinegar. This is so simple. You place a large amount of bones, sinew, meat scraps, etc. in a large stockpot (which is not aluminum). You bring it to a simmer, skim the scum off the top, add the vegetables of your choice, cover, and let simmer for at least twelve hours. Why twelve hours? An old French cookbook explained that scientists had tested the mineral content of broth, and found that twelve hours of simmering was needed to release a significant amount of minerals and nutrients from the bones into the broth. I usually simmer my broth for a bit more than 12 hours, but there are people who simmer it much longer. Their broth is probably more nutrient-dense, but I am happy with mine. 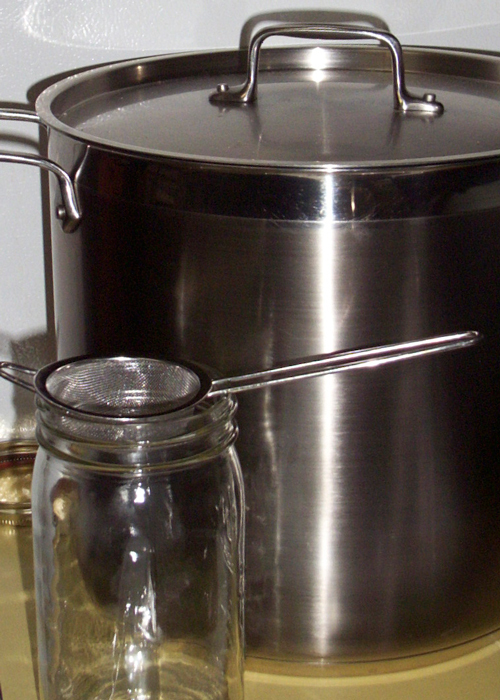 After the broth is ready, it is strained and placed in containers. There are several ways to store and preserve it. We each drink a big mug of hot broth every day, sipping it slowly, usually just before dinner. It is so refreshing and renewing, and helps prepare our bodies for digestion. The high gelatin content soothes the stomach, and aids digestion. We are also taking what I consider the best mineral supplement on earth, as natural as it could possibly be, in the way of our ancestors. The proof of these benefits is in our strong, dense teeth and bones, and the complete absence of any problems with our joints and bones. Many people have used such broths to fight off sickness and help the body recover from illness. In fact, there are too many benefits to list them all. These benefits may be why I get a happy feeling as I make broth. And it makes the absolute best gravies and sauces. Any way you look at it, traditional homemade broth is the best! The centerpiece of the traditional Thanksgiving feast. Thanksgiving gets a great deal of attention every year. For many, it is a time for families to see each other over a large traditional meal. Thanksgiving is the American feast. I like the idea of being thankful for the good things in my life. I happen to love the tradition, and to love eating the old favorites, prepared from real food. Yet I must confess something. I also love to cook the Thanksgiving feast. Yes, it is a lot of work. Especially when you add the trimmings, such as homemade stuffing and real gravy, made with fresh broth and the magnificent turkey drippings. But to see the joy it brings to those who eat it-that is truly fulfilling. And chances are that your work will be very much appreciated. And I want to confess something else. It is not that complicated. If you get real ingredients, even average cooking skills will result in a wonderful meal. I make a turkey, a stuffing, roast some vegetables in the pan with the turkey, roast some sweet potatoes on the side, make some simple boiled vegetables, and a wonderful gravy from the drippings. None of these items are difficult to prepare. It is just that there are a lot of them, and some are time consuming. The solution is planning and organization. I plan the cooking of each dish, organize the ingredients, start early in the morning, and it always goes well. And the smell of the roasting turkey, lovingly basted with butter, is just magnificent. Often, you can also get family members and friends to help with some of the tasks, and it can become a fun project, with a result that everyone will enjoy. It has become common for supermarkets to offer people a full Thanksgiving meal, which just needs to be reheated, for a large amount of money. I am certain that no reheated meal from a store can possibly compete with a home cooked meal of real food. Food prepared for people you love or like, with love, has a special quality all its own. Happy Thanksgiving! May you and yours eat well! This post is part of Real Food Wednesday blog carnival. Classic European root vegetables for soup. As I continue to write and research my upcoming book on traditional cooking, I kept running into the same fact. The use of homemade broth was universal across traditional Europe. This kind of broth, made from the bones, sinews, and meat scraps of pastured animals, and simmered slowly for a long time, at least twelve hours, is a nutritional powerhouse of minerals and other nutrients. Yet I found something else. While this broth was often heated and sipped by itself, it was common to add other ingredients to make it into a soup. The variety of these soups was almost endless, yet certain ingredients were used over and over. These ingredients were used from Spain to Russia, and everywhere in between. These ingredients were always shredded or cut very small, in the traditional soups. Since I believe that our ancestors combined ingredients for nutritional reasons, I decided to make a soup out of homemade broth and these widely used ingredients. I did so last night, to fend off the cold of an approaching winter, and to strengthen a body that was fighting something off. I was lucky, and feel that I found something so beneficial that it goes beyond broth in its benefits. The type of soup that European peasants made for themselves, to extract every bit of nutrition from the food they were able to get. I have many traditional cookbooks. I have collected these books for over thirty years, and I have so many I am embarrassed to give the actual number. I began searching these books for soup recipes using these ingredients. I came across so many recipes that I could not decide, and they were all blending together in my head and thought. So I decided to go with the flow, and follow the thought I was having. A recipe began to form in my mind. Cabbage. Finely shredded cabbage was used in these kind of soups almost everywhere in Europe. I had learned that cabbage, both as sauerkraut and fresh cabbage, was heavily used in winter, and in much of the rest of the year. Fresh cabbage will keep a long time in a traditional root cellar, in cool or cold weather. Carrots. Finely chopped carrots were another common ingredient. Carrots were also a universal ingredient of these types of soups. Onion. The onion, valued since the days of ancient Egypt, was another universal ingredient. Except that the finely chopped onions were usually sautéed in some kind of animal fat as the first step in making the soup. Fat. These soups almost always had some kind of fat that was used to sauté the onion, either bacon, or chicken fat, or butter, or salt pork, or ham fat, or olive oil, or others, depending on what was available. Potato. The use of the potato in these soups was also almost universal. Potatoes were not introduced to Europe until the seventeenth century, at which point they replaced the previously ubiquitous turnip. Salt and Pepper. Used by almost everyone to season the soup. Everyone had salt, and pepper was also common, though often not available for the poorer families. I noticed that everyone cut these vegetables very small, shredding them or even cutting them into pieces the size of threads. I decided to settle for finely chopped vegetables. I sautéed the onion in a medium sized saucepan with three tablespoons of butter. I then added a quart of homemade beef broth, cabbage, carrot, and a small potato, all finely chopped. I brought the mixture to a simmer, covered the pot, and simmered it for twenty minutes. The aroma of this soup, when I opened the lid, was fantastic. The soup was placed in large bowls. It was very hot, temperature wise, and we sipped it slowly. We added salt and pepper to taste. It was wonderful, nourishing, filling, warming. It was very filling. In fact, I felt that I was filling my body with easily absorbed nutrients, and I began to feel very good. By the time I had finished a bowl of soup, I felt very satisfied, totally warm, and healthy. The last traces of whatever illness I was fighting off disappeared. I woke this morning feeling completely fine, and immediately got to work on this post. Our ancestors knew how to combine foods, how to get the nutrients into their bodies in beneficial combinations. Traditional cooking is not only delicious, but nourishing. The Butchers Tale, or Is Real Food Worth It? Cuts of grass fed meat. I ran into one of my favorite butchers yesterday. He was trained the old way, when butchering was an art. He knows a lot about all kinds of meat. He can cut steaks and roasts that are so beautiful that they are like a fine painting. He had just finished reading Tender Grassfed Barbecue. He said that he agreed with everything I wrote about nutrition. He could see it in the meat, over the many years he was a butcher. He had wondered for a long time why grain-finished meat looked so different, and was so full of blocky streaks of fat, rather than the fine marbling he looked for in a superior piece of meat. He said that he believed that most conventional foods were not that nutritious. And then he let out a shocker. I have heard words like these from so many people. It is too hard, too much trouble, and too expensive, to make the switch to real food. It is very hard to make the switch. It is a lot of trouble. And, many people will think you are nuts. Absolutely. The blessings of good health and mental clarity that I have received from changing my diet are worth all the trouble, expense, and even being made fun of or being thought of as a nut. It has been like being reborn. Many years ago, when I was twenty, my Dad asked me if I ever felt good when I woke up in the morning, full of energy, eager for the challenges and pleasures of the day. I honestly told him that I never did. I did not even know what he was talking about. When I woke up, I was discouraged, annoyed, short of breath, and in pain. I thought I was well nourished, because I was big and looked powerful. And because I followed my doctor’s advice on what to eat. I thought I was getting the best medical care in the world. So why was I so sick, exhausted, and miserable? I am convinced I was suffering from severe malnutrition, like most Americans. And I did not even know it. Because it is easy to find, buy, and use conventional food, I had convenience. But I did not have health. Eventually, things deteriorated to the point where the medical profession had no help to give me, and told me so. Rather than give up and die as predicted, I got furious. I got determined. I used my skills as a research attorney to find another way. What I found was the website of the Weston A. Price Foundation, and the priceless information on their website enabled me not only to save my life, but become healthy for the very first time as an adult. I knew I had to switch to real food. It was difficult. I had to drop most of the food items I used to buy. I thought I loved many of them, though in reality, I was addicted. I had to learn a whole new way of cooking. And we spent much more money on food than we were used to. And I had to deal with the fact that some of the foods I needed could not be bought, only made. Making homemade broth, especially skimming it, and straining it, seemed so hard. Learning how to cook grassfed meat was hard, especially when I kept ruining it and there was nothing I could find that taught me how to cook it. 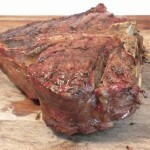 I wrote Tender Grassfed Meat to make it easier for others to learn how to cook this wonderful meat. Making my own fermented foods was hard, at first. And I really missed the factory foods I was addicted to. But once I learned how to make broth, cook grassfed meat, and make fermented foods, it became familiar and easy. Still time consuming, but easy. I learned how to find and buy real food, which became fun. And the extra expense became easier to accept, as we adjusted our spending priorities, realizing that nothing we can buy is as important as the good food that keeps us healthy. We also learned how to find sales and bargains, which really helped. The addiction to the factory foods began to fade, as we ate much better real food alternatives. Many of our family members, friends, and acquaintances thought we were too picky. Some got offended when I would not eat the conventional food they liked. The convincing argument, the one that convinced me that real food was worth all the time, expense, and trouble, is this—I became much healthier. When properly nourished, the natural functions of my body kept me healthy, without any drugs. My mind became much sharper, and the occasional short term memory problems disappeared. The quality of my life became so much better, in every way. Now I wake up each morning eager for the challenges and pleasures of the day, full of energy, and so happy to be here. I finally understand what my Dad was talking about, so many years ago. 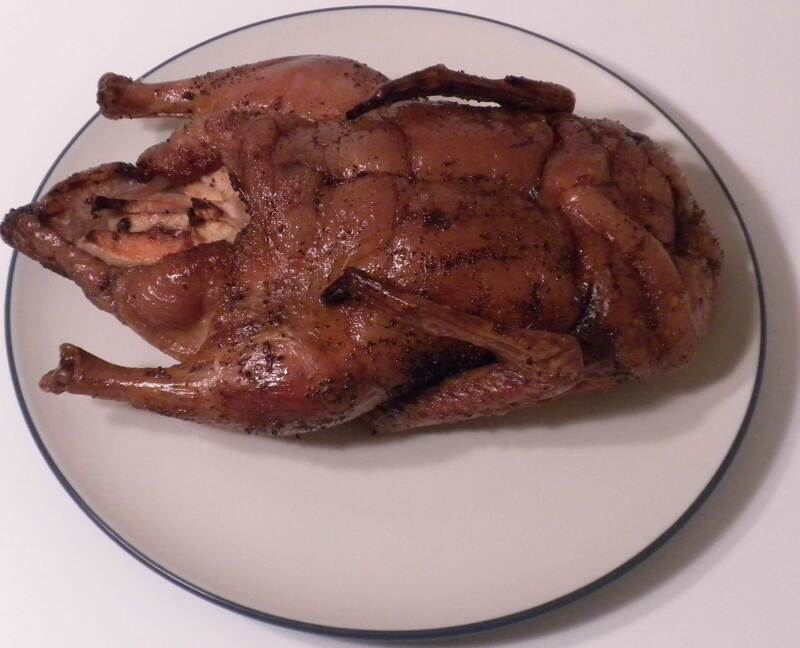 This delicious roast duck is perfect for winter. Our ancestors usually ate their food in season. This did not just apply to fruits and vegetables, but also to meats which were available all year round. In Europe and America, this used to mean that a great deal of animal fat was eaten during the winter. In fact, the people who lived in cold climates, all over the world, prized animal fat and ate a great deal of it when the weather was cold. This enabled people to survive and thrive in some very cold climates, even within the arctic circle. This was not just done for cultural reasons, but because of an important fact I just learned for myself—animal fat makes winter better—much better. Cold weather had always been difficult for humans. In fact, many people counted winters rather than years when describing someone’s age. To these people, surviving the winter was a real accomplishment. It has been more common for people to get sick and die during a cold winter. There are several reasons for this. There is little sunlight, which means much less Vitamin D. Vitamin D is crucial for the proper functioning of the immune system. The cold is a strain on the body, which is made worse by rain and snow, much worse by freezing weather and blizzards. Most people just try to stay warm and dry. But our ancestors did not consider shelter to be enough. They had another remedy for winter that was very important to them—animal fat. Many European peoples would eat fattier foods during winter. Even the game they hunted put on fat for the winter, so older, fatter animals were prized at that time. Rich pork dishes from fat pigs, using lard and the skin, were winter favorites. 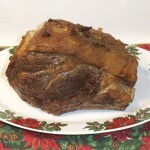 Fatty lamb roasts and stews were a winter favorite. In fact, every kind of meat stew was made in winter, always with plenty of animal fat. Geese and ducks were usually eaten during the winter, because of the fat they carried. Winter was the most likely time for people to have meat, and many animals were slaughtered and salted, often in the form of hams or fat sausages, in preparation for winter. All of this animal fat was pastured, as factory foods did not exist at this time. In old Russia, fat foods for winter were so prized that poems were written about them, praising the virtues of the various kinds of fat, including lamb fat, beef fat, butter, and the favorite, real pork lard. Eating animal fat during winter was considered vital for health. Unfortunately, many people were too poor to afford enough fat and fatty meats, and were unable to get the benefits. But for those who could afford it, fatty meats and animal fat played a crucial role in winter survival. The benefits of good animal fat have been documented by the Weston A. Price Foundation, as shown in this excellent article The Skinny on Fats. Pastured animal fats are particularly valuable in winter because they are rich in Vitamin D, especially the fatty organ meats, and butter. Pastured animal fats are wonderful fuel for the body, providing perhaps the best source of energy, with none of the negative effects of sugar or too many carbs. This helps the body to function better. Recently we were hit with a spell of unusually cold weather, and I decided to up our intake of real animal fats. We ate fatty roasts and stews, used more real lard, butter, beef tallow, and other such fats, and enjoyed fatty ducks and organ meats. The results of this experiments is that my energy increased, and I felt strong and eager for the work of the day. The tiredness I might feel from the cold and gloom disappeared with a nice bowl of fatty stew, or hot broth made from real bones and meat scraps. This is just my experience, but it helped me to understand why my European ancestors valued fat in the winter so much. Winter is coming. In Europe, those words were a serious warning. Winter, with the freezing cold it brought, the snow and occasional blizzards, was the time when many people died. In fact, often a person’s age and health were measured by how many winters they had survived. The Native Americans of the Great Plains also used this measurement. Whether one survived the winter, before central heating and supermarkets, was largely dependent on having shelter, fuel, and, most importantly, the food that ensured survival. Our ancestors learned much about what to eat during this dangerous time, and passed this knowledge down through the generations. While most people in the U.S. and Europe do not see winter as a threat, more people do get sick in winter and more people die. Many people expect to have colds and flus during winter, and many do. Most people have no idea of what their ancestors ate to survive the winter, and depend on doctors and prescription drugs, or over-the-counter drugs, to get them through it. Unfortunately, doctors know nothing about curing colds and flus, and the drugs are of limited effectiveness and all have negative effects. Some take flu shots, and get sick anyway. We can still use the wisdom of our ancestors to stay healthy during the winter, by eating the foods that make our immune systems strong and able to fight off colds and illness. Our ancestors used a number of foods in winter, foods that they knew would help them stay healthy. Here are a few of the favorites in Europe and the United States. This is the number one winter survival food in the entire world. Made from the bones of grassfed animals and pastured poultry, or wild game, these broths were the best mineral supplement ever invented. The long simmering process, usually at least twelve hours, extracted the nutrients, minerals, and gelatin from the bones and meat, and put it into the broth, where it could be easily absorbed. The gelatin from the bones and cartilage was also invaluable, improving the digestion, nourishing the gut, providing a protective coating to membranes and the stomach, and enabling the body to keep digesting and absorbing the nutrients from food. The broths were always cooked with plenty of unrefined salt, which also nourished and protected the body. The broths were always drunk hot, not scalding, but hot. The hot, nourishing liquid warmed the body from the inside as it was slowly sipped, helping to ward off the cold . Those who had it would drink broth every day of the winter, plenty of it. 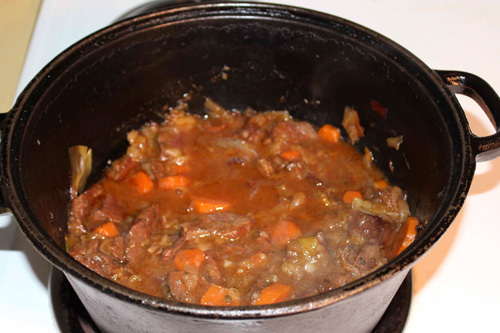 A traditional European stew contained grassfed meat, onions, garlic, and a number of other winter vegetables. Often broth was added. These ingredients were slowly simmered together for hours, which caused the vegetables to disintegrate into the gravy. The meat also broke down, and merged its nutrients with those of the vegetables. When the stew was ready, it would be very tender, and thick. The tender meat and vegetables were easy to digest, and the nutrients extracted from the ingredients form the long cooking process were easy to digest and absorb. These stews were also rich in minerals and gelatin. They were always served hot, and there are few things as warming and satisfying as a forkful of hot, traditional stew. Eating a stew like this after coming in from the cold is one of the most satisfying things you can do, as your taste buds and body welcome the badly needed nutrients. It was hard to get fresh vegetables in the cold of winter, yet our ancestors had their ways. Onions, carrots, and cabbage would keep for a long time in a root cellar, and were full of nutrients. Just about every stew, broth, and pot roast was made with onions, and carrots were also often available. Turnips would also keep in a root cellar, and were widely used. Later on, turnips were largely replaced by potatoes. These traditional vegetables were often added to broths and stews, and greatly increased the nutritional value of these warming dishes. 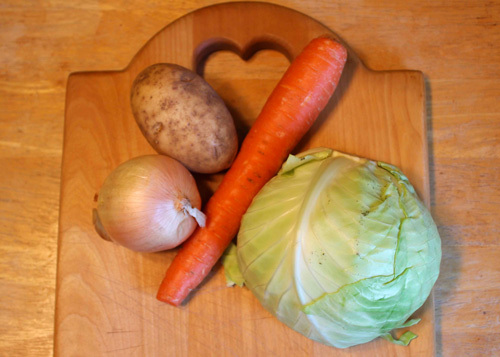 Cabbage was not only cooked into stews and broths, but fermented into sauerkraut. Fruit was often dried during the fall and eaten during the winter, often cooked into stews, and added vital nutrients. Dried apples were a favorite in Europe. Traditional fermented foods were a crucial part of the winter diet, all over Europe and the cold parts of Asia. The fermenting process not only preserved the food, but actually increased its vitamin content. The most famous and crucial fermented food was sauerkraut, which was eaten every day in small quantities, providing crucial vitamins such as Vitamin C, and friendly bacteria that helped the immune system and the digestive system. Many other vegetables were also fermented. The fermentation process used was lacto fermentation, which used salt and natural bacteria to do the job. This type of fermentation is the only way to get the nutrients from these foods that our ancestors did. These traditional dishes consisted of cooking a large piece of pastured meat, always one of the cheaper cuts, in a covered pot with spices, herbs, and winter vegetables, with some liquid added, often broth. These delicious concoctions were cooked slowly until very tender, and until much of the vegetables had dissolved into the heavenly gravy. Very tender, and full of nutrients like a stew, these roasts were also served hot, and would warm the body and soul on a cold day, while giving valuable nutrition. And the smell as the meat slowly simmers away is so good. The more tender cuts of meat, containing much fat, both in the meat and covering the meat, were expensive, and beyond the means of most people. But the nobles and those who could afford them would make great use of them in winter. Grassfed meat, roasted in its own fat, often served rare or medium, is loaded with vital nutrients, and the smell of roasting meat and fat is one of the best on earth. These roasts were served hot, with plenty of their own fat, which was eaten along with the meat. The pastured fat was full of vital nutrients, and helped the body resist the cold, while nourishing the brain. Even people of more modest means would enjoy roasts at feasts and holidays, with beef, lamb, pork, geese, ducks, and fat chickens being the favorites. The fat skin of geese and ducks was particularly prized as a winter food, as was the crisp fat that covered beef, pork and lamb roasts. Eaten hot, these were absolutely delicious. These roasts were often served with rich sauces and gravies made from their own fat and drippings, often with butter and cream, or added broth. These sauces added even more fat to the dish, in a most delicious and warming way. Much of the meat used in earlier times was dried, or salted, or fermented, so it would be available when needed in the winter. Ham, sausage, bacon, salt pork, pastrami, corned beef, and salted beef are examples of these foods. Fish were often salted or dried, also for the winter. These heavily salted meats were also eaten hot, and the fat they often contained helped the body resist the cold. Bacon in particular was a popular winter food, as were hundreds of kinds of sausages. The heavy fat content in these products not only made them delicious, but helped people resist the cold. There are many other winter foods, but these are some of the main ones. We always eat plenty of broth, stews, pot roasts, and roasts during the winter. 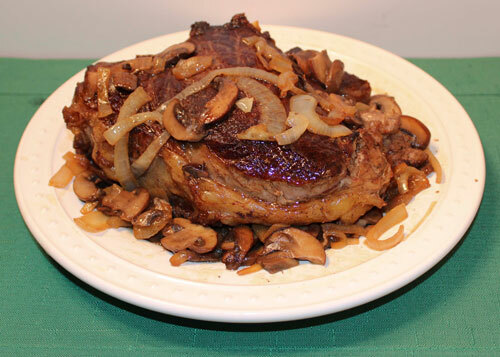 There are recipes for many of these traditional foods in Tender Grassfed Meat. I can often feel the strength and health flow into me as we eat these traditional foods. Good food can do more to keep us healthy, in my opinion, than anything else. And it tastes so good. Our ancestors sipped traditional beef bone broth throughout the day. The huge storm that struck the Eastern United States is a sobering reminder of the power of nature. The storm has brought an early winter to much of the nation, causing intense cold and snowstorms in some areas. Our ancestors had a number of traditional foods that they used to help them survive the long, cold winters. These time-tested traditional dishes kept people warm and filled their bodies with the nutrients needed to deal with the demands of winter. They were also delicious. My family has adopted the custom of having lots of bone broth, stews, pot roasts. and the occasional celebratory roast for a special occasion. We use only grassfed or pastured meats for this purpose. Not only do we enjoy the wonderful tastes of traditional food, but we stay healthy, without medication. Our ancestors had a lot of wisdom. 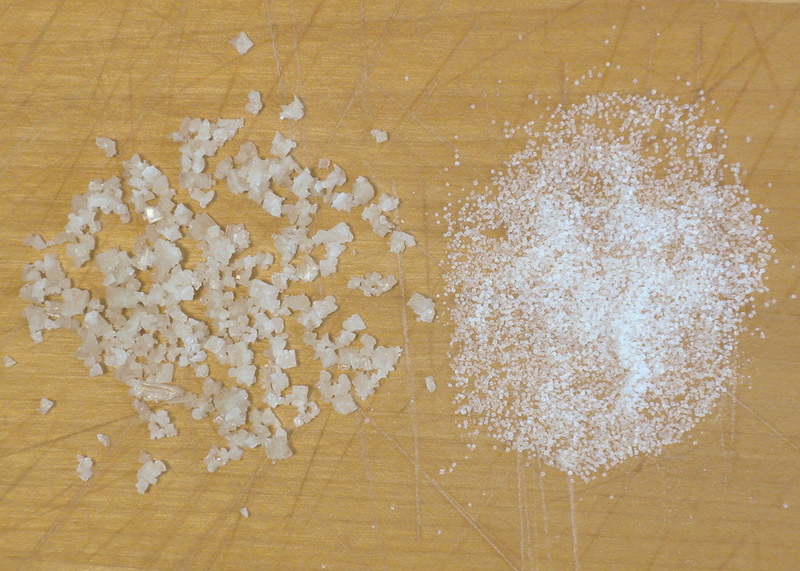 Natural Celtic Sea Salt on the left and factory salt on the right. Salt is one of the most vital human nutrients, and our ancestors knew this. Yet, the consumption of salt is now under attack. The government is trying to reduce the amount of salt people consume, claiming that it will improve health and prevent strokes and heart disease. Part of the Paleo movement is opposed to adding salt to food, believing that our Paleolithic ancestors did not add salt to food. Many people believe salt is very harmful. Because I advise against pre-salting grassfed meat in my cookbooks, some people assume I do this to reduce salt consumption. All of these beliefs are mistaken. If we do not consume enough salt, our bodies do not function properly. Ultimately, if people do not get enough salt, they die. While all salt originally came from the sea, it is available in different forms. It must be understood that two general types of salt are available. They are not the same. The most common salt is factory salt, which is composed of salt that has been stripped of its minerals, and has had chemicals and flavoring agents (often including sugar) added. This salt is a pure white color. It is ground very fine and flows easily out of a salt shaker, almost never caking. This kind of salt did not exist before the twentieth century. This is by far the most common form of salt in the United States, used extensively in processed foods and by most people, who are usually unaware that the minerals have been stripped out, or that chemicals and even sugar have been added to the refined salt. Then there is pure, unmodified salt from nature, often harvested from the sea, though it is also found in solid deposits on land. This salt, consisting of nothing but sea salt and minerals, is the traditional salt that humanity has used since the beginning. This traditional salt is the only salt I use or recommend. The belief that early humans did not add salt to food is mistaken. I remember reading about how the early colonists of the United States would choose a site for settlement. They would always have someone, usually a skilled hunter or scout, follow some of the wild animal trails in the area. They were looking for one thing they absolutely had to have, or they would not settle in that area—salt. Wild animals also need salt, and they would find salt deposits, usually called “salt licks.” The animals would find salt deposits, and get their salt by licking them. There is every reason to believe that early hunters and gatherers did the same, and found salt by following wild animals or their trails. All the old writings on cooking, including those going back thousands of years, describe the addition of salt to food. Salt was greatly valued in ancient times, being more expensive than gold in some areas. The reason is quite simple. Our ancestors knew that they needed to add salt to their food to live and thrive. Our ancestors used salt to preserve and ferment foods, and created many artisanal foods based on the use of salt, including sauerkraut, ham, cheese, jerky, sausage, and countless others. Our ancestors ate far more salt than we do. If we do not get enough salt, these vital body functions are adversely effected. If you were to put anyone on a totally salt-free diet, they would eventually die, after much suffering. We often crave salt, because our bodies so desperately need it. If you crave salt, it may be that you are not getting enough. Is Salt Good? Or Bad? Or Both? In the past when heart disease and strokes were very rare, traditional peoples and most humans consumed much more salt than people do today. And we know that the Japanese, who have the highest average salt consumption on earth, have among the highest average lifespans on earth. So how do we know what is true, when the research is conflicting and history contradicts some of the research? The difference may be in the type of salt consumed. Prior to the twentieth century, all the salt consumed on earth was traditional salt, without chemical additives, with the natural minerals left in. I believe that this kind of salt is not harmful, and is vital to our health. The studies done that support the idea that salt increases the risk of stroke and heart disease were all done at a time when factory salt was used. These studies are only relevant to the use of factory salt. To the extent that studies have found harm from salt consumption, it may be because of the chemicals, or the fact the minerals are stripped out, or both. So my own personal belief is that it is good, and important, to eat all the traditional salt I want, without fear. At the same time, I avoid factory salt as much as possible. Please be aware that I am not a doctor, or a scientist, and I am not legally qualified to give any kind of health advice to anyone, so I am not giving advice—just stating my personal belief and what I do. I advise against salting most grassfed meat too far in advance. This advice is given solely because I have found that long pre-salting tends to toughen some grassfed meats. I do use plenty of traditional salt at the table, and will often salt meat just before it is cooked. The right amount of salt really brings out the flavor of food, and is absolutely vital to the taste, nutrition, and flavor of homemade broth. I do enjoy the salt of the earth, and I do not fear it. This post is part of Fat Tuesday, Monday Mania, Real Food Wednesday, Fight Back Friday, and Freaky Friday blog carnivals.